Deja Vu bills itself online as a place for a romantic cocktail, and later in the evening, a good party. It has a Bulgarian owner and some food on the menu that calls itself Bulgarian, but that is certainly in the background. For me, it was reason #1. The scene here is small and a bit kitschy, but both in a good way. A hipster might walk in curious and roll their eyes, but the simple place maintains a level of class and treats its customers well. The woman who ran the bar both times I visited was a delight. 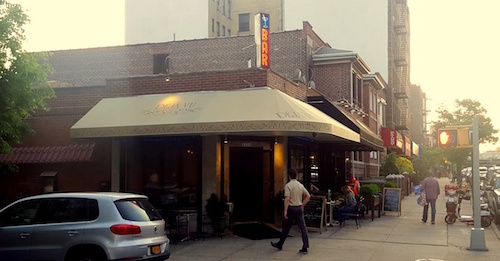 The food is by no means a full representation of Bulgarian cuisine, and sticks with the grilled Balkan meats similar to other restaurants nearby in Astoria. 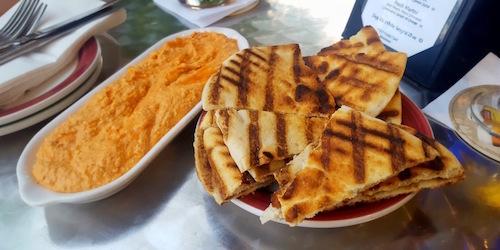 We ordered a plate of hummus ($6, below) served with a heaping plate of warm just-grilled pita slices. The hummus is homemade with roasted red peppers, served in a generous portion that requires healthy scoops to finish completely. Dried meats are very common throughout the Balkans and Northern Africa. 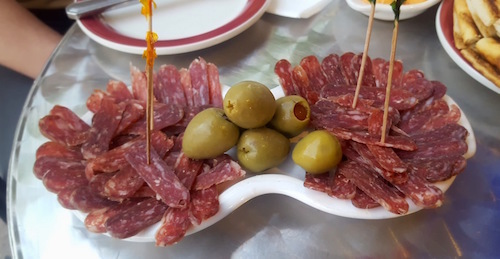 Here they offer a sudjuk meze ($6, below), a plate with Bulgarian dry salami also made in house and served with pitted olives. The "Grilled Delights" section of the menu is really just a way to offer three varieties of the same grilled meat. 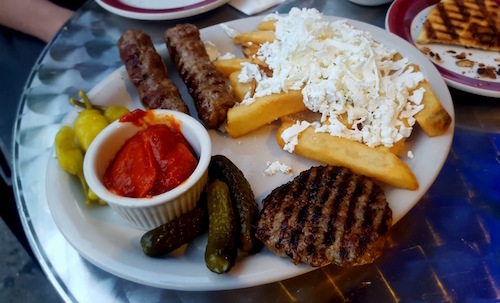 We went for the grand slam Deja Vu Grill ($16, below), which promises the kufte and kebapche along with a side of fries and feta. The portion of meat is not immense but it is satisfying, especially when slathered with the accompanying ajvar, a roasted red pepper sauce that should be on every table in the world, not just the Balkans. 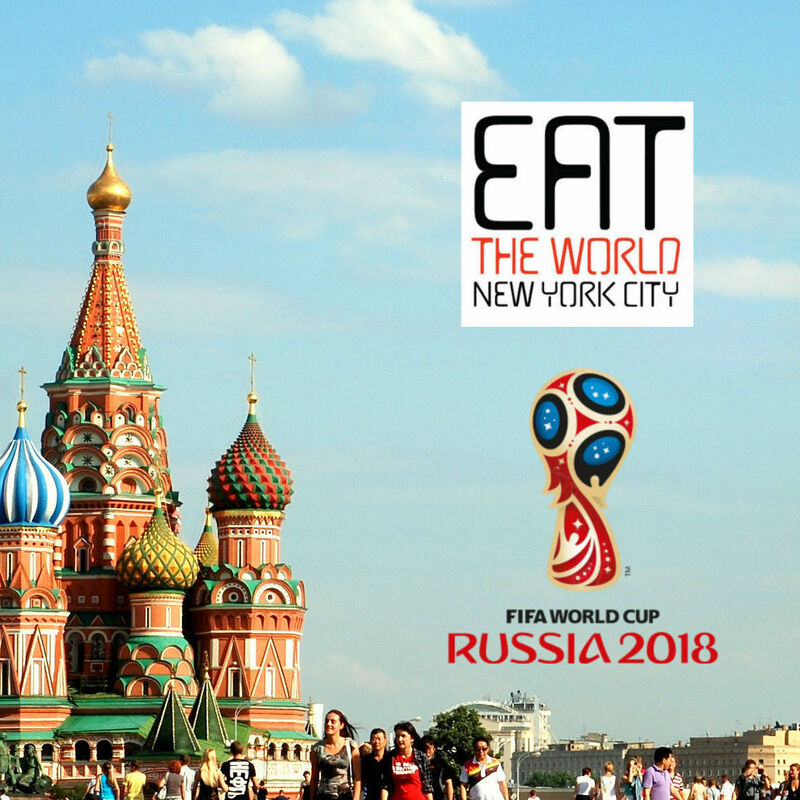 Their heavily promoted happy hour is from when they open at 6pm until a very generous 9pm, so time your visit right on a weekday and enjoy good discounts on your drinks.